For different reasons, the singular work of the painter, illustrator and cartoonist Pere Torné Esquius (Barcelona 1879- Flavancourt, France, 1936) doesn't fit in with either the modernist proposals or the noucentista style (turn of the century), even though the latter considered him to be one of theirs. 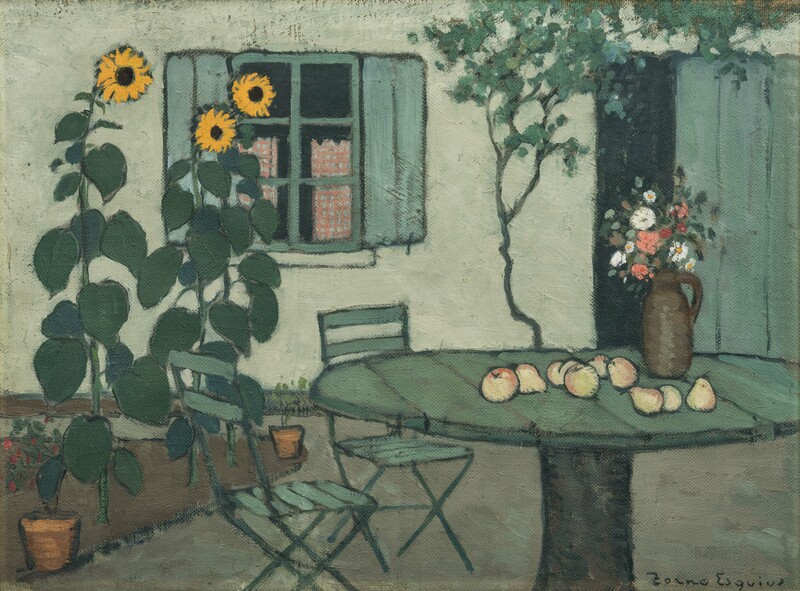 Settled in Paris from 1905 onwards, although he would often return to Barcelona to regularly exhibit there, his work, of apparent simplicity, responded to a certain primitivism which was somewhat naive and with a strong French influence. His painting, highly singular, maintained pictorial and atmospheric values which provided the whole production with a sense of unity. The favourite topics of Torné Esquius were interior or secluded spaces, such as gardens or living rooms, humble or of artisan extraction. It is worth highlighting, very often, the absence of the human figure and the main presence of inanimate elements that on occasions would cause a disturbing or even alarming effect. He also produced other genres such as landscapes or portraits. Despite the fact that he was a painter, his professional work was based on illustration, focused on three main lines: children's literature, the illustration of literary texts and the collaboration in magazines and periodical publications, often satirical, such as Papitu, Picarol or Le Rire, amongst others. Pere Torné Esquius (1879-1936) created original work of great singularity that eluded categorisation during his time. Torné began his foray into art at the peak of Modernisme and left Catalonia when this movement was still relevant; but he was also claimed by the Noucentistas, despite his work having registers and solutions that do not always conform to Noucentisme orthodoxy. What is certain is that Torné Esquius used all the resources and means at his disposal to add a poetic aura to the most mundane aspects of daily life, as evidenced by his famous Dolços indrets and interior paintings to street scenes. In his unique artistic method, pictures simply serve to provide an evocative force for emotions so as to transmit them. Torné Esquius alternated painting with illustration in newspapers and magazines, a task with which he earned his living in France. But he would come to Barcelona every year to exhibit, and this is why almost all his works are in private collections. Many of these pieces are displayed for the first time in this anthological exhibition, the first dedicated to him by a public museum. Torné Esquius’ beginnings as an artist were similar to those of many artists of his time: he trained at the School of Fine Arts in Barcelona, together with Picasso, and was a member of the Artistic Circle of Sant Lluc. Apart from several collaborations in the press, he made his first major solo exhibition at Sala Parés in 1903, where he presented some thirty works, in which gallant themes of Modernista style with French influences dominated. 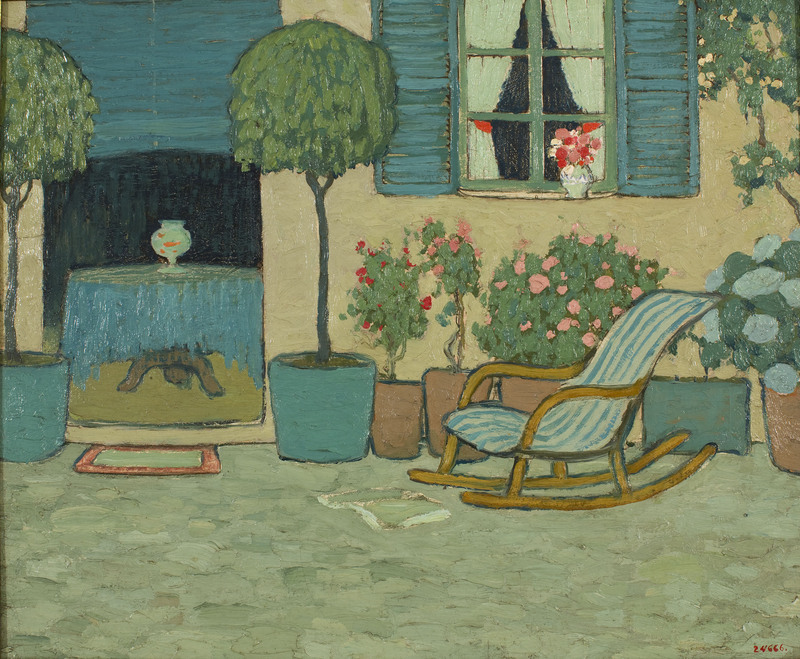 In 1905 he exchanged Barcelona for Paris, but before he did he exhibited Flors del Camí (Flowers along the road), a series of drawing mainly depicting street scenes. Unlike Barcelona sceneries, not seen in his work, the Parisian landscape was a common theme in his oil paintings and would remain so during much of his career. Before leaving for Paris, Torné Esquius finished several ink drawings which together formed a delicate catalogue from different corners of the Catalan geography, as well as a certain inventory of popular domestic architecture and religious elements. These ink drawings would not see the light of day until 1910, when they were brought together into an album entitled Els Dolços Indrets de Catalunya (Pleasant Places in Catalonia), with careful editing by Oliva de Vilanova. This album, today a true bibliophile’s item, was immediately accepted into the Noucentista aesthetic canon. One of Torné Esquius’ main themes was eroticism, which he depicted suggestively. This depiction disrupts his usual production, mainly his street scenes, which he had focused on since his beginnings. Images of female nudes contrast with the street scenes, where members of subordinate classes are portrayed, such as nurses or coachmen, and of course children, where his artistic skills are evidenced, especially with a focus on ink. Both subjects appear in Catalan publications, but mostly in French ones, where a change from his usual illustrative code takes place: less synthetic and more colourful, forced by the necessity of the publications themselves. In addition to painting, Torné Esquius also earned a professional living by illustrating for newspapers and magazines. In France, he collaborated with magazines such as Le Rire, Fantasio, La Vie parisienne and Le Courrier français, and in Catalonia with Papitu and La Ilustració Catalana, among others. The illustrations were produced in parallel with his contemporary work, often replicating the same themes. The world of entertainment for children focused on circuses and puppets, as well as the figure of the harlequin, comprised a particular aesthetic universe. In many of these compositions, the focus was where child’s attention was drawn, rather than the representation itself. The name of Torné Esquius is one that is closely linked to graphic arts because of his regular collaborations with Ramon Tobella, owner of one of the leading presses during Noucentisme’s heyday. As an in-house illustrator of reference, many of the printed materials that were published in the Tobella workshop in Barcelona (postcards, menus, greeting cards, etc.) carry his unmistakable stamp. Despite its ephemeral nature, the quality and attention with which these materials were printed ensured they became collectors’ items, and as such have survived to this day. Torné Esquius was able to create a very personal language, especially in the recreation of the world of children. It is a transversal theme in his career, which had already appeared in his early exhibitions, and this room contains only a minimal representation of what existed. He projected this world onto all his classical registers, from drawing and painting to his illustrations in newspapers and magazines. But it was above all the illustration of children’s books and educational books for children that was his most popular work. He applied his plain and naïve language to all of them, with its great evocative power and capacity to transmit emotions. In life, Torné Esquius was known as the “Painter of Interiors,” an epithet which is still used for him, as a substantial part of his paintings are of interior/exterior domestic scenes, without any human presence. Formally and conceptually, these paintings derive from the interiors that are shown in the Dolços Indrets, to the point that Torné would replicate more than one. A moment suspended in time, the expressive charge of these interiors, rendered with a naive facture, rests with the inanimate objects that inhabit them, witnesses of a life that throbs elsewhere. It is no wonder some may seem enigmatic.